A roof that’s completely flat is a defective roof. Why? Because without a slight slope to direct water to the perimeters or a central drain system, it will develop a ponding problem. 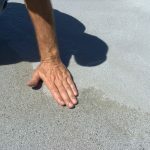 A ponding roof is a roof that still has water on it 48 hours after a rain storm, and repeated episodes of ponding on a flat roof will inevitably compromise the roof over time. Even when there has been no rain for a while, you can still determine whether a roof has a ponding problem. 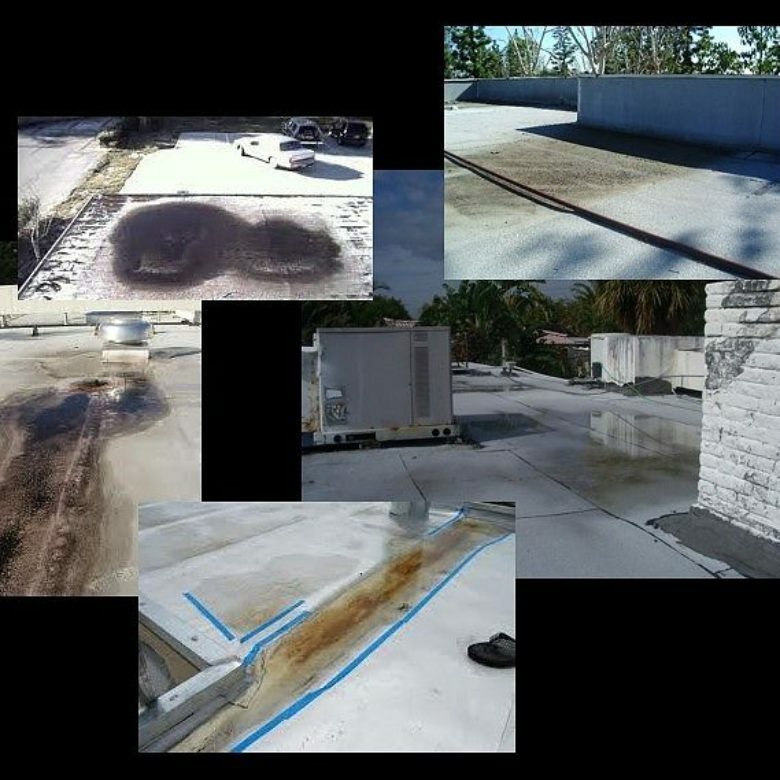 Look for dirty circles on the surface of the roof, or areas with algae or other vegetation are indications that water ponds on your flat roof. Drainage from flat roofs usually take the form of gutters and downspouts, internal drains and scuppers. (A scupper is a drainage device in the form of an opening in a wall, a parapet wall, or a raised roof edge, and is typically lined with a sheet metal “sleeve”. It allows water runoff to drain into a downspout or leader. It’s not the same as a drain, which channel water through the deck of the roof and into pipes that carry the water away. If a roof scupper clogs up, it also can cause ponding or leaks. 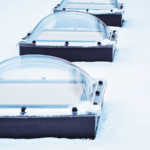 In a well-designed roof, there are often two sets of scuppers — primary scuppers at the level of the roof membrane, and secondary scuppers that are two inches above the low point, to act as emergency drains in case the primary scuppers become blocked. On a large flat roof, internal drains are essential since the roof slope can’t possibly direct all of the water to the roof’s edges to drain through the scuppers and into the gutters and downspouts. Problems often result if you don’t have enough internal drains. Again, it’s best to check with a roofing professional about this. Add auxiliary sloping with RoofSlope, a product formulated for Cap-Sheet flat roofs. 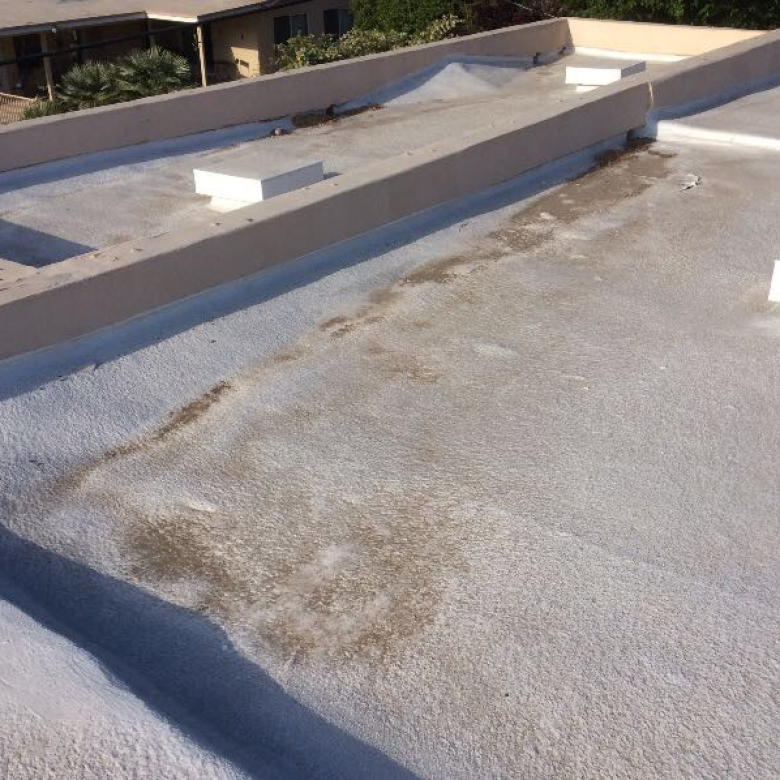 Typically, ponding is excluded from warranties on Cap-Sheet roofs, meaning that if your roof is damaged due to ponding, the expense of repairing that damage is yours alone. RoofSlope provides a cost-effective solution for correcting poor or inadequate drainage without compromising the integrity of the Cap-Sheet installation. In addition to improving slope, the product is also UV stable, durable, fast-drying, requires only one coat, and provides a superior bond over multiple substrates. Once applied, you don’t need to do anything else, although you can add a coating of your choice if you want to. RoofSlope is water-resistant, not waterproof, so make sure to repair roof damage before applying the product. Don’t hesitate to contact us with any questions you may have or to find a distributor in your area. For more detailed information about how to apply RoofSlope, be sure check out our instructional video!